Lots of people I meet want to be artists. What they don't realize is that they already are. We come into this life bursting with creativity—enthusiastic little art creatures. Then it gets drummed out of us. Little by little, we get serious. We stop making art. But, creativity is our natural state and one day it starts to gnaw at us. We look around and all the castles we've built are hollow without creative expression. The problem most often is that we've forgotten how to play. So the art comes back tight and constricted. We learned early to color inside the lines. And now we're stuck. It takes time return to the place of magic and wonderment. Lots of people start with such wonderfully earnest intentions. They buy equipment and supplies and enroll in a course or find a tutor. Then life makes demands and the work progresses more slowly than expected. Frustration sets in and the art withers and dies. It is the saddest of things to behold. More than anything, the key is to show up for yourself. Show up on the good art days and be there on the bad art days. Show up. Even if it's for ten minutes of bad art, show up. Bad art is necessary for good art. Sometimes bad art is actually very good art in disguise. You won't know unless you show up for it, make it, and behold it. People talk about talent all the time, as if there were a talent fairy in the sky, doling out talent seeds to the lucky few. In reality, it's mostly about doing bad work until it becomes good work. Having a good sense of humor helps. A lot. The notion of the serious artist gets in the way of the playful artist. Learning how to play again might be the most difficult tasks adults ever have. Showing up is the first and most important step in the process. 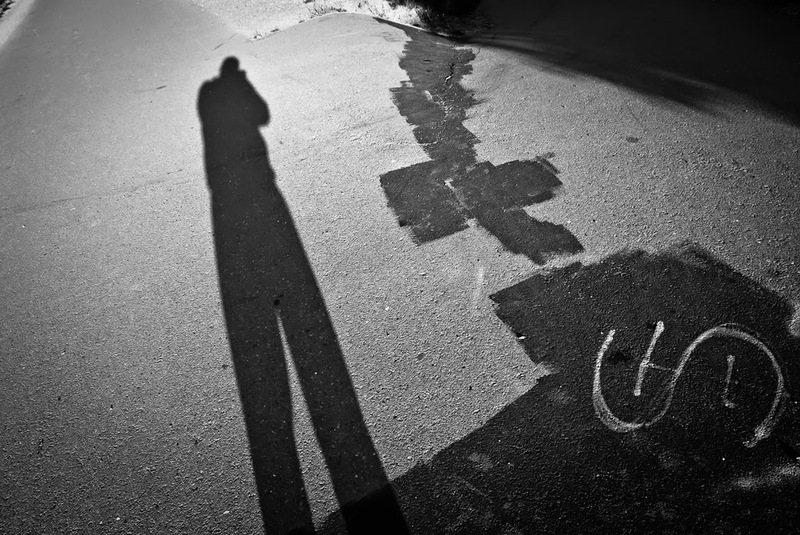 Today's image is yet another looming shadow. I'm attracted to the ominous darkness of the image and musical quality of the patches in the pavement. It feels like something is about to happen. The image simply came to me during a walk. Because I had my camera with me, I was able to make the photo. No camera, no photo. The first step of showing up, if you are a photographer, is to have your camera with you. Always.